"Going Green" is more than a fad and has become a way of life. Better Life Maids founder Angela Ricketts provides tips on some green business opportunities available to Green Moms wanting to start their own green business. There are literally limitless possibilities to create a small enterprise to support a mom's green business ambitions. And how big it can grow it is only limited by imagination. Going “green” is clearly more than a fad or a passing whim of society in the US. In fact, the average household used to produce over 6 pounds of trash per day, and that number shot down to 4.7 during 2011. There is a very interesting phenomenon that happens when you become a parent. "You suddenly realize that you DO need to worry about what happens once you are gone. 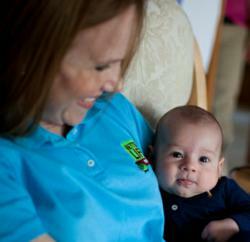 Thus many new moms grasp for ways to go green," said Better Life Maids founder Angela Ricketts. She experienced the same phenomenon when she had her first child, and this was in fact one of her motivations when founding Better Life Maids. Angela provides 5 tips on picking a simple and green businesses for green moms. Many publications cover ways that people can “go green,” but no one has ever spoken to that working mom that perhaps wants to go beyond recycling and make an even bigger change: starting a green business. Better Life Maids founder Angela Ricketts was a green mom who took her idea of creating a green house cleaning service and grew it into a national brand. Below she shares some interesting businesses concepts, including the Better Life Maids franchise system, that allow for a "green mom" to make money while actually saving the environment. "Run your own cloth diapering service," was the first idea Ricketts discussed. While there are many commercial entities out there, they are cost prohibitive to many, and the costs are actually minimal if a prospective entrepreneur already has a high-efficiency/large load system. "Once you get over the "Ick Factor" you can see that this a service that many new moms are considering," said Ricketts. "Become an organic baby food maker in your neighborhood/mom’s groups – selling your “leftovers”. When you are already making food for baby is a great way to earn some extra money." With this idea Angela cautions that you may need to meet certain local regulations before selling to the public. "Start a green house cleaning service, or you can franchise your very own Better Life Maids." Said Ricketts. Green house cleaning services are a growing business segment. Angela goes on to explain "A Better Life Maids franchise makes it easy to start a successful green house cleaning business. Franchising allows you to focus on growing your business, not creating a business." Create a secondhand store via a consistent garage sale to get rid of old clothes, and make extra cash. "I had so many garage sales that I even named it Annie's Attic. I had one nearly every month during the spring, summer and fall. I literally had regulars. It was a significant source of income." Create an organic garden and sell the produce. Find out the rules and regulations for selling your produce at local farmers markets. This is a fun way to get outside, meet new people at the markets, and network for future business ideas on a larger scale. Make crafts and sell them on a site like Etsy. Really the sky is the limit on what small hand made crafts can be produced and sold. Sites like Pinterest will allow a green mom to market her creative idea to a much larger audience. Obviously these are just a few ideas. There are literally limitless possibilities to create a small enterprise to support a mom's green business ambitions. And how big it can grow it is only limited by imagination.